This website allows the viewers to look and view exclusive maps of this trail. I made the maps based on what I've hiked and seen. The maps provided by the county restrict accuracy and have proposed routes. The trail maps I've provided show the most accurate views of Patriot's Path and ensure accuracy. These maps map all parts of the trail, most are accurate, some will be tweaked as I hike the trail, so make sure you have the most updated trail information. Hope these maps will help with knowing where the trail access points are. This site also provides updates of reroutes, and extensions. Also, I provide trail reviews in my blog, and pictures of the trail. I also have pictures of other trails I like to hike and bike. 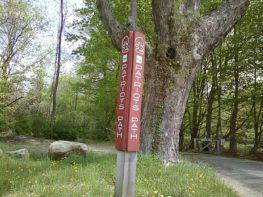 I have directions telling you where trailheads are and lots more! Contact me if you have any comments, concerns, or questions. Google Earth on my website is coming soon, but for now if you have the Google Earth Application, click here to access the page to download a trail overlay. If you don't have the application and you don't want it, use the map below to access as much of the trail provided by Google Maps.